SEE, HEAR OCEAN! SECLUDED, YET CONVENIENTLY LOCATED. AWESOME VIEW. BEST RATE! 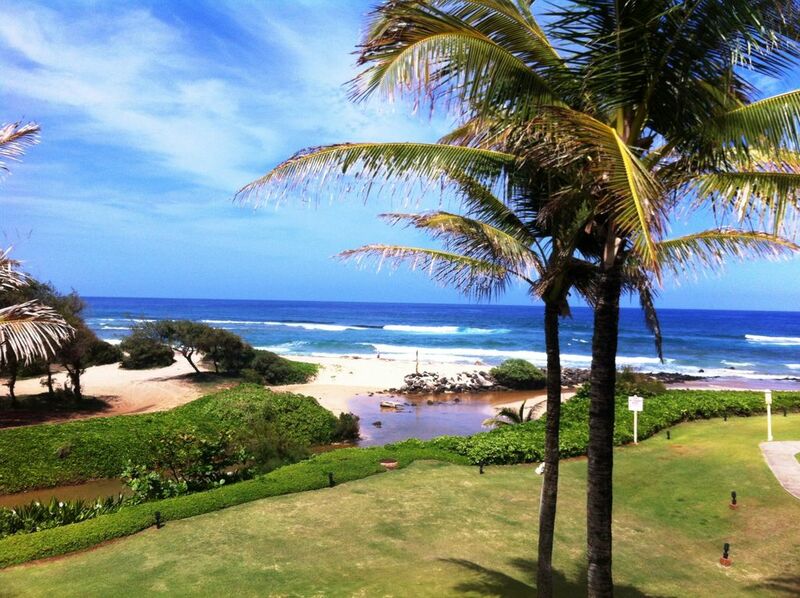 Spectacular Ocean View, Spacious 2 bed/2 bath condo at Kauai's favorite resort. See and hear waves come ashore on the beach a few yards away from this lovely, spacious, condominium with SPECTACULAR PANORAMIC OCEAN VIEWS! Footsteps to a long golden sand beach with nothing but nature for miles in all directions. Rare opportunity to enjoy the REAL HAWAII you came to see! Secluded yet conveniently located for easy touring. Twelve acres of lushly landscaped tropical gardens and lagoons. Kauai Beach Villas and offers a swimming pool and jet spa FREE of charge. From October 2018 through 2019 the glamorous pools and spas at the hotel are also FREE. Enjoy BBQ picnic areas, and tennis courts free of charge. Golf is available adjacent Wailua Municipal Golf Course. We take pride in offering the LOWEST PRICE of all the 2 bedroom beachfront, ocean view condos at Kauai Beach Villas! Our guests come back year after year for the breath-taking panoramic ocean view. We recently completed an extensive 3-month long renovation. New bathrooms, a transformed kitchen with granite counter tops. New sliders, tile, carpet, washer/dryer. Freshly painted throughout. 50' TV in living room plus TVs for both bedrooms. New highest quality beds, new tasteful tropical motif furniture. The condo looks fabulous! You'll be kept comfortably cool by AC in bedrooms and fans throughout the condo as well as by cooling easterly trade winds. We invite you to take advantage of our exceptional offer as the best-priced beach front, ocean view condo at Kauai Beach Villas. LAST MINUTE DISCOUNT for May 5 - 14, 2019 at just $199 a night! We already have the best rate for a 2 bedroom/ 2 bathroom beachfront, ocean view resort condo on Kauai, so this is a give away! Aloha! We are Joyce and Don from Ketchikan, Alaska and we like making our condo as comfortable and inviting as possible for our guests' enjoymen. Before we bought F-10, we rented it as visitors every time we came to Kauai. It was by far our favorite condo. So, when it was offered for sale we were thrilled that we were able to buy it and call it our own. The first thing we did was to completely renovate it. We set aside 3 months to make the condo the best it could possibly be. We put in all new sliders and windows, took the bathrooms down to the studs so we could create spiffy new ones, installed new kitchen appliances and granite counter tops. We had new tile floors and new carpets installed and bought top-of-the-line furniture and incredibly comfortable beds. The extensive renovation was a lot of hard work but worth the effort to transform it to a place that would please the most fastidious of vacation renters (which includes ourselves!) We come to stay in our condo a couple of times a year and each time we make sure that everything is up to our standards. Of course, we still manage to sit out on the lanai to enjoy watching the waves roll ashore and take morning walks along the beach to watch the sun rise. We are indeed very lucky! In searching for a property on Kauai, we wanted a convenient location, centrally located on the East Shore. We also wanted to be within 30 minutes from the north shore and the south shores. We love the secluded location - it's perfect for us and our friends who want to sight-see or just relax on the balcony lanai watching and listening to the waves come ashore just a few yards away. The view of the ocean fills the living room and dining alcove and it takes our breath away. We feel assured that our guests will be taken care of because Judy, the property manager, lives in the condo just above. She's happy to share insider tips on the best places to visit on Kauai and tried and true restaurants. We both love the ocean and couldn't imagine having a place in Hawaii unless we were RIGHT ON THE BEACH. We so enjoy our fabulous view of the ocean which fills the living room and dining alcove. And since the beach is just a few steps away it's great walking along the miles of natural, undeveloped shoreline. We wanted a spacious condo since we knew we'd be inviting family and friends to come stay with us. We have lots of room, so everyone feels they have their own space and are very relaxed. Our family and friends especially like sitting in the nice, hot jacuzzi looking up at the stars at night after a hard day of sightseeing. toilet, shower, All new from top to bottom! Bathrooms completely redone in 2014. Walk to directly out onto the beach in 60 seconds. Swimming pool and spa. 12 acres of lush tropical flowers, plants and stately palm trees. Tranquil lagoons, sparkling fountains, spiffy clean BBQ picnic areas. Panoramic ocean view. See and hear waves caressing the golden sand beach just yards away. Beach is just footsteps away. Sandy beach goes on for miles with no other development in sight. The Wailua Municipal Golf Course is our neighbor. Emerald green mountains and peaceful lagoons with fountains can be enjoyed from the bedrooms and balcony lanais. Fabulous ocean view on the other side of the condo! Enjoy panoramic view of the ocean from the comfort of your living room sofa, large balcony lanai and dining alcove. Can't get any closer to the ocean than this! Located right in your condo. Yes, right in your condo. Spacious living room and large lanai take in the breath-taking panoramic ocean view. Nice new kitchen with full size refrigerator, stove, microwave, dishwasher, top quality cabinets and granite counters. 50' TV in living room and TVs in both bedrooms. Nice selection of books for both adults and children. We have a few selections. 12 acres of lushly landscaped gardens surrounding lagoons with fountains. You can rent kayaks to paddle up Wailua River near by and hike to Secret Falls. Yes. 2 courts. All Free of charge. Wailua Municipal Golf Course, with reasonable rates, is right next door. You can use all pools and spas at the resort, including those at the hotel FREE OF CHARGE in 2019. Check with us about 2020 pool use at the hotel. Pool and spa are ALWAYS FREE at Kauai Beach Villas. Our location is the best on the island. We're centrally located on the East Shore for easy touring and yet secluded at the same time. The airport is a two mile drive from the condo. It's a great place get away and just relax surrounded by nature. The beach goes on for miles without any development - a rarity anywhere in the world. Our guests come back year after year to enjoy the breath-taking panoramic ocean view. You can hear and see the ocean from the comfort of your living room sofa, the dining alcove, and the large lanai where you sit and relax watching the waves roll onto the shore. We offer the very best rate for a beach front, ocean view resort condo. Since our rate is so reasonable, it's often rented to just 1 couple. The condo is spacious and nicely laid out making it ideal for families and 2 couples traveling together. Perfect place for two couples. The condo had everything we needed for our stay and was very clean.. Great pools and beach to walk on. Manager, Judy was so helpful and kind. The location is perfect for accessing all the island and the airport. We’d definitely stay here again! Thanks so much. Very well appointed and stocked with every item we needed. Perfect location. We really enjoyed our stay and had great weather throughout. The pool and amenities at the hotel were perfect and kept the grandkids entertained. Can’t say enough how much we liked the condo, clean, nice view, comfortable beds, convenient location. Judy is super helpful. We had a wonderful stay in this property. You couldn't beat the view and and accommodations were fantastic. The unit was well equipped and perfect for our family. Judy was an excellent host and was available anytime to answer any questions. The location was great to explore all areas of the island. We’re always happy to hear that our guests have enjoyed their stay at our condo! We had a wonderful time in Kauai. The place was exactly as described and Judy was always available to answer questions and had nice suggestions to help us enjoy our stay even more. The condo is very well taken care of and the kitchen had everything we needed for preparing and enjoying meals without the hassle of going out every night. We loved the location and felt the price was very reasonable compared to other alternatives on the Island. We hope to come back again! Thank you for your great review. When our guests are happy so are we! Looking forward to your return visit! The condo is very well equipped and setup very nice ! We were 2 couples and it really was a great setup for us. Had everything we needed for our week long stay. Was perfect for having a morning coffee on the lanai and watching whales out in the ocean and there were lots of them out there!! Just a nice drive out of Lihue..maybe 5 minutes and central ro everything to do on island!! The owner lives right above and she was so helpful with things to do and see on the island.. her recommendations were spot on!!! Would HIGHLY RECOMMEND this place if you are ever coming to Kauia!! We’re delighted that our guests had such an enjoyable time staying at our condo. We're really lucky to be in a secluded spot away from congested development on a long sandy beach at a resort that has it all: glorious beach walks, pool, spa, tennis courts amid acres of tropical gardens, lagoons, BBQ cook out areas with picnic tables, near a golf course. Being conveniently located on the east shore, it's an easy drive to water falls, hiking, kayaking, the best restaurants, a variety of shops and grocery stores, and the main shopping center on the island all within a 15-minute drive.